Modern man is a broken creature, a domesticated man no better than cattle, and the mixing of species is what caused this – as explained here, here and here. It started a long time ago, and still happens as we speak, and it will probably go on for some time before the modern man is gone. Mankind still has quality though, individuals worthy of life, strong in mind and heart, in limbs and bones. They shy away from the human domestication, they feel repulsed by it and take steps to free themselves from the cage they live in. They understand that our modern life style – with the domestication of both animals and humans – is destructive and try to find alternatives. They don’t cling to utopian dreams where all our problems are solved in the future by even more “progress” in technology and science, by some deus ex machina. The “progress” is in effect only domesticating us even more, and thus just accelerate the fall of man (as can be seen very well the last hundred years or so). Instead the good men accept reality and know that the gods must cherry pick from humanity, so to speak, and let the rest pass away into death and darkness. Those few cherries must be preserved for what is to come after the great deluge – that has to come and that Mother Nature will bring about herself. The real “god from the machine” is the man who sits down and finds out how he can survive the great deluge, and return to the lifestyle of the most ancients. He will also understand that all the technology we surround ourselves with, that makes life so easy, is just making us weak and stupid and useless, and must also pass into oblivion. And stay there. When a man in the new world tries to make something easier he will not be allowed to. Life is for the strong and able, the healthy (beautiful) and harmonious man, not for lazy weaklings who always try to take the shortest paths to the objectives. Man will become better again, slowly at first, and then fast, until he is as strong, able, beautiful and harmonious as he used to be, in the forgotten ages. Until he is what he can be and what he should be. HailaR MannR! HailaR WôðanaR! A very inspiring piece Varg, thanks. With regard to sapiens, you should note that protoneanderthals had created them. What for? Take Theory of catastrophes for instance. There’re law which governs how much energy is available and it’s really a challange to dewise the way to advance technology not for two thousands years but much more. Envisage you have a mound of sand banked up, you adding sand up to it, slowly. Eventually you’ll reach a moment when all the pyramid collapse. Just one grain of sand can cause a catastrophe of the sand pyramide you maybe have been banking up for years. Important moment you should spot here the base of the pyramid stays almost the same deviating in quality. That is how our Sun made so metastable and unique star by Mugnetic Tubes Flux. Bear cult still practised in Siberia has the ritual when one place scull of a bear on the tree, Tree of Life. It’s not hard to assosiate it with stolons in development biology. The point is if yuo want to advance for thousand years in closed thermodynamical system you have no choice other that to head all your system to the catastrophe for the reason of changing your base. Our society has long now been about the survival of the weakest. I just found it interesting when you mention strong people who do not only look for the easiest way. Lots of people in todays society are basically completely physically retarded. A big second group suffer from at least one or another physical retardation. These two groups constitute the majority of people. Very few people are highly physically able people. These people are ofcourse who we should strive to become like. There is also a big group of people who are in generally physically able, and do not suffer from one of the many possible physical problems in todays society. All the same surely applies to mental retardation, not only in the traditional way anymore, but there is a large group of people who go through life “sleeping”. They are not mentally awake at all. They bury their faces in their telephones for example, and stay in that world most of the day while ignoring the world around them. They simply don’t pay attention, and their mind goes numb as a result, leaving them unable to understand even basic things that a person who is paying attention to the world around understands. Absolutely beautiful. Also by modern technology does this include Guns/Skinning & Butchering knives/ and other modern hunting equipment? Should we return to exactly what our Neanderthal forebears used to hunt and gather food? It would make us stronger, no doubt. I wish I could make this concept more applicable to my lifestyle. Maybe it is silly to be reminded of a video game, but they also contain truth sometimes. In the “Half-Life” series, there is an extraterrestrial species which has become so lazy and dependent on technology, that they are extremely fat and seen moving around in personal flying machines similar to wheelchairs, no longer capable of moving on their own. They are the real antagonists of the game because they invade Earth, intending to exploit its resources until it becomes nothing but a wasteland, since they have consumed all the natural resources on their own home planet. They also enslave other species to use them for labor and as soldiers (they mutilate and brainwash them so they can’t think on their own, so they become utterly subservient to their new masters). But I do agree for the most part. We can still strive for excellence (arête as the Greeks would say) and we must because modern man is so degenerated. We must keep our eyes on the gods as inspiration. I am fond of Marie´s theories and yours. But I´ve been thinking that the proportion of mongrelization between Western,Northern and South Europeans must be seen with a larger lens. 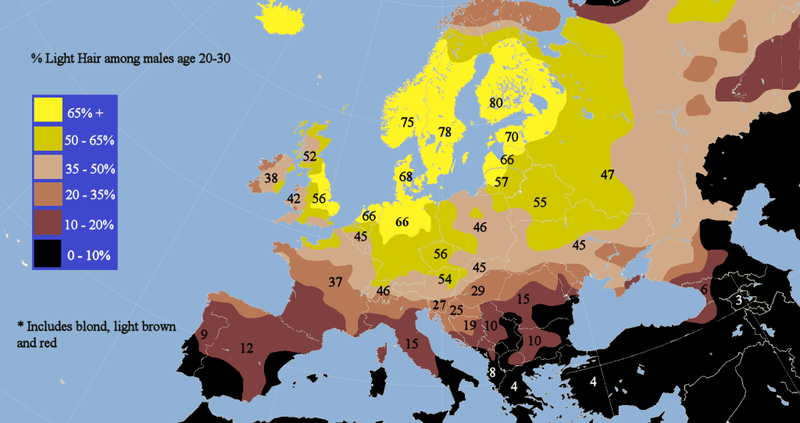 For example in Spain we find the whitest skin tone(Yes surprising even to me…), however when this individuals display this whitest skin, their hair is not blond, nor red, is Brunette or almost black(not black as africans or native Americans) For example basque people… You can see the most Neanderthal features in them, even the language. Of course there were Blond Neanderthals, Even Redheads, but they were also Neanderthals not mongrelized with Africans that displayed this other varieties of eyes and hair. You can find as you suggested more mongrelized individuals in Spain, Italy, etc. But you can also find the purest(and this individuals take care of with who they marry to remain white). The combination between Blond And Redhead creates brunette. And when you have both copies of the genes maybe strawberryblond(or blond, or red). There is a confusion that our fellow European brothers look more “mongrelized” because it seems so because of the color of their eyes or hair, but it is only more diversity from the Neanderthal. We can see in Scandinavia blond people that in a morphological way looks more negroid, but with these countries mentioned before, we do not see this morphological features, Of course in Scandinavia remains a lot of “pure individuals” do not misinterpret me. But because in Scandinavia there is a large proportion of the “blond gene” these features mascarade themselves as it does with blond mongols, people of which you have talked before. If I am wrong, in the formulation of this subtheory of yours, feel free to correct me. No, you can find the purest Europeans in Northern Europe. And what you say here is extremely ignorant and illogical too. Red hair and extremely pale skin is not a result of “fairness” but of more red melanin than brown melanin. Blondes on the other hand have less of both types of melanin. Red hair is an old mutation that is actually mostly a problem, but still is there. The red melanin makes red-haired people Sun burn very easily, but not tan, and they have less resistance to heat than others do (but are actually more resistant to poison and pain). Don’t confuse Samis for Scandinavians. They have mongol features yes, but Scandinavians don’t. Thank you. I will reconsider it. I needed to get it out of my mind, My mistake to make, they were doubts I had. It is sometimes difficult to filtrate the truth. I will stick with your theories, as always. excellent post Varg. can i just say that your posts on Thulean Perspective over the last month have been your very best. there is a clarity and reason that is really ‘hits home’. you have a way of perfectly encapsulating our current dilemma’s and the absolute simplicity in solving them. it really is simple!! if we think like our forebears and reject the cancerous modern ways. thankyou for your writings. “Another suggestion is that the strange skin, eye and hair colours seen in Europe are down to ancient interbreeding with the Neanderthals, who died out about 25,000 years ago. There is plenty of evidence. They just don’t want us to know. Check out atala.fr. This is hardly true. They tell us only lies, so why should it be different this time? They still try and cling to out of Africa theory as this new article shows. Yes. They have no shame. Another beautiful young girl, fair in the flesh, light in the hair and eyes, has been rescued from a gypsy camp. This time in Dublin. This story aggrieves me deeply, especially since it is in my own country this time. I hate seeing this happen to my nation — and my nation was pretty much wholly homogenous until around 10-15 years ago (didn’t even know what a Muslim was until 9/11). Basically they came when we got some money, as before Ireland was utterly broke. Got to love a welfare state that the third world can take advantage of, eh? Now we’re broke again so “asylum” seekers have stopped applying in large numbers. Anyway, similar to what zephyros1981 said below, I find this blog to be amazing for my handling of Europe’s current state. Thanks Varg. Every post helps. Wow. That sounds great. I wish I could say the same, or rather that I had never ever heard of them. This is very good news indeed ! Sigh…. I’m all out of jokes about how fast you make these posts. You’re on your own this time. I learned that that lesson 1 dead mp3 player, one broken Kindle reader, 3 pairs of headphones, and 3 fried external hard drives ago while I was on a ship for four months last year 😀 All of it for no apparent reason, I didn’t drop any of these electronics and decided never again to rely on electronic media. I really like that melody. Have you ever ones with chanting/singing? From the driving force behind man’s development take away the desire to make things easier and you’re left with something much purer. Thanks for that thought.